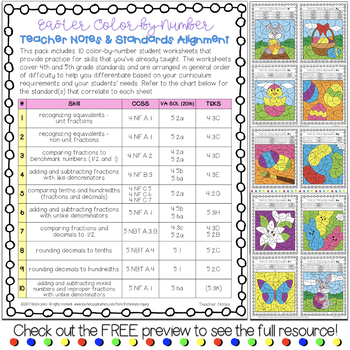 Practice fractions and decimals skills with these 10 leveled color-by-number worksheets. Each page features a different skill, such as identifying equivalent fractions, comparing fractions and decimals to benchmark numbers, and adding and subtracting fractions with like or unlike denominators. Correlated to 4th and 5th Grade CCSS, TEKS, and VA SOL standards. Perfect for a spring math center! 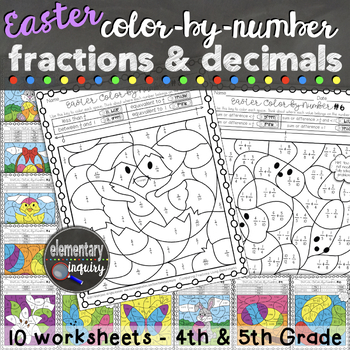 This product is included at a discount in my Fractions and Decimals Color by Number Holiday Themes Bundle! All products in the bundle follow the same format of pages, but contain different problems so they can be used throughout the year in the same classroom. Please follow my store for updates about new products like this and leave feedback to let me know what you think of this product! Let’s connect! Visit my blog, and follow me on Pinterest and Instagram!